Today, the Fireside Bowl is a decent dive for friends to gather and play some retro tenpin in Logan Square. But less than a decade ago, as any alternative music fan at the time remembers, this place was a punk rock mecca. From 1994 to 2004, Fireside was the equivalent of CBGB in New York: an underground music club of epic debauchery and delirium. Rats scurried out of the speakers and nights usually culminated at 4 a.m. in a mess of drunken, moshing bodies. Alkaline Trio, Shellac, Ted Leo, Fall Out Boy, Sleater-Kinney, Tortoise and the Dismemberment Plan all played there — and rocked so hard, in fact, that the doors fell off the men’s bathroom and the walls caved in. Fireside began hosting live music again in 2010, but lately, business has slowed. One reason for the downturn may be the limited schedule: bands can only play for six to eight weeks during the summer, as league games tend to dominate the rest of the year. Bowling is the main attraction, and now that the focus has shifted from wild partying to good old-fashioned fun, the "unruly" music shows have taken a backseat. Also, with so many other stages to choose from (Liars, Reggie’s, Cobra Lounge and Lincoln Hall, to name a few), most bands don’t even consider booking the Fireside Bowl. In fact, many young concertgoers have never heard of this historic and now seemingly forgotten venue. On rare occasions, bands stop by to pay homage to the good old days, like White Mystery returning to Chicago for their summer tour. But Fireside now trails far behind other venues in terms of attendance and acclaim. Possibly the most exciting thing to happen at Fireside in recent years was Vince Vaughn filming scenes for The Breakup in 2005. At one time, the Fireside Bowl was legendary. Now, according to many disgruntled Chicagoans, the magic has soured. Some Yelp reviewers have been particularly unkind, complaining about everything from bad service to the building’s dilapidated condition to the musty “old” smell that fills the air. Here’s a thought: Maybe people will stop complaining about the smell if they’re at a PUNK ROCK show! They’ll be too busy moshing and getting drunk to care about cleanliness or the staff tending to their needs post-haste. And, with the recent resurgence of punk rockers in the local music scene (like “flower punk” wunderkinds The Orwells, still in high school!) the timing of a Fireside revival couldn’t be more perfect. The Fireside was great when mP Productions booked shows there. Maybe a punk night held once a week, run by mP and filled to the brim with local music, could breathe life back into a once sacred haunt. 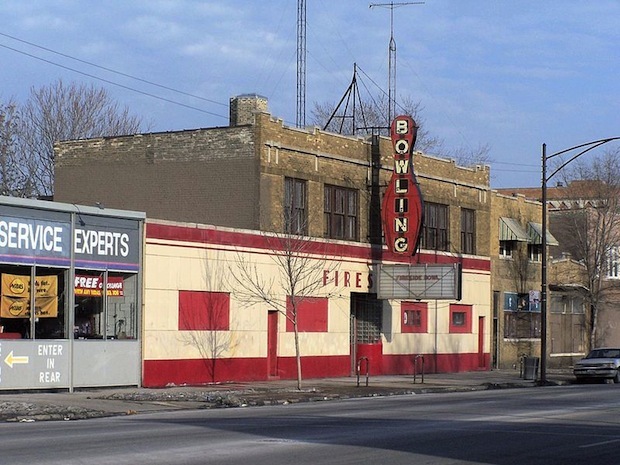 Just throw in a little building renovation, positive word of mouth and impressive headliners to stir up a local cult following, and the Fireside Bowl could become the hottest ticket in Chicago&apos;s underground music scene once again.